I found this great recipe for Roasted Pork and Potatoes on southernfood.about.com but we are a no potato house. 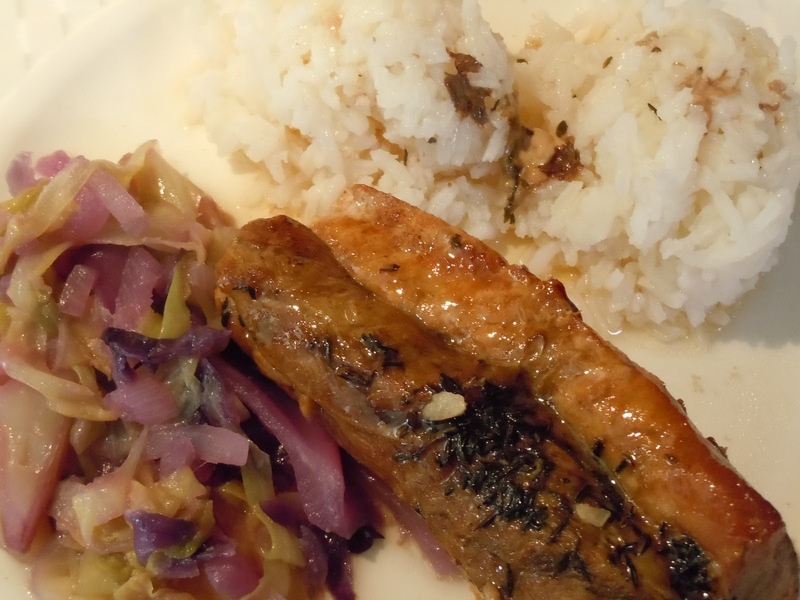 I cooked the meat without the potatoes and served it up with rice and Sauteed Cabbage on the side. De-e-e-e-lish! This dish worked so well without the potatoes that I wondered how it would fair witout them in the slow-cooker. Homerun, again! Here is my slow-cooker version of southernfood.about.com's Roasted Pork and Potato recipe. 1 boneless pork loin roast, about 3-4 lbs. Slice cabbages and onion into thick, julienne-style slices. If these are cut too thin, they will cooke too fast and have no flavor once the meat has finished cooking. Spread the sliced vegetables around the bottom of the slow-cooker. Sprinkle veggies with 1/2 t garlic powder and a little salt. The salt will draw water out of the cabbage so do not overdo it. You can always add more after cooking. Rub the pork loin with garlic powder, onion powder, thyme then sprinkle with salt. Place the pork loin on top of the vegetable mixture. Pour about 3 cups of water into the slow cooker, being careful not to pour it over the meat. The water should cover the bottom of the cooker, coming up the sides no more than 1/2 inch. Close the slow-cooker and leave to cook for 8 hours on low heat. Be careful not to open the slow-cooker during cooking as this extends cooking time by at least 30 minutes while the cooker builds up heat again. When finished, remove the pork loin and slice to serve. Serve pork and cabbage over rice.